On March 8, Zhang Mengxing, Deputy Party Secretary and President of China MCC, met with Hu Guangyu, Deputy Director of Department of Policy and Regulations of General Administration of Sport of China and Executive Deputy Director of Olympic Preparation Office, who was on a visit to MCC. The two sides exchanged opinions and reached a consensus on further strengthening the all-round in-depth cooperation in such fields as gymnasiums and stadiums, complexes, distinctive towns, infrastructures, brands and talents. Zhang Mengxing pointed out that MCC had successfully transformed itself into a national team for metallurgical construction, a main force of infrastructure construction and a leader in emerging industries, and had long stuck to the road of hi-tech and high-quality development. With the advantages and talents accumulated in the past in the construction of iron and steel industry, large-span steel structures, large gymnasiums and stadiums, distinctive towns, theme parks and others have become the main business and advantageous fields of MCC. MCC successfully participated in the construction of such sports facilities as national stadium (Bird Nest) and is actively undertaking the construction of major gymnasiums and stadiums as well as facilities for the XXIV Olympic Winter Games. Zhang Mengxing expressed that it was admirable that the General Administration of Sport of China planned the development of sports with an open and enlightened attitude and a vision of development. We would call together experts and talents in relevant fields to establish a special work group to communicate with the General Administration of Sport of China and the Olympic Preparation Office in an in-depth manner, sign cooperation agreement as soon as possible, strengthen deep cooperation in such fields as gymnasiums and stadiums, complexes, distinctive towns, infrastructures, brands and talents, and continue to make greater contributions to the sports of the state, to the improvement of the health level and happiness index of the people in the state. Hu Guangyu briefly introduced the development condition of sports in the state and preparation condition of Olympic Games and winter games. He pointed out that the General Administration of Sports of China had intensified its reform efforts and proposed such new concepts as sports economy system in new era, actively explored how to cooperate with enterprises, encouraged all people to work for sports to form a new image in the new era, facilitated brand development towards the world and made contributions to the supply-side structural reform of the state. The holding of the Winter Olympics would promote the great development of ice and snow sports of the state. The modernization of cities and enhancement of awareness of all people for health also required a large number of comprehensive professional gymnasiums and stadiums. The Genera Administration of Sport of China and the Olympic Preparation Office would like to cooperate with large central enterprises with powerful strength like MCC. Both sides should strengthen communication and sign strategic cooperation agreement as soon as possible. He hoped that MCC could give full play to its advantages in such aspects as technology, talents and experience, actively participate in the reconstruction of gymnasiums and stadiums and development and construction in such fields as urban sports complexes and theme parks. The General Administration of Sport of China and the Olympic Preparation Office would certainly provide strong support. 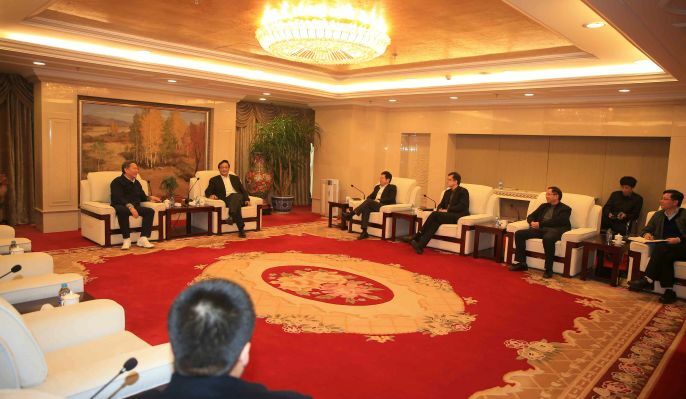 Relevant personnel of MCC, including Tian Guixiang, Wang Wei and Yang Kui, attended the meeting.